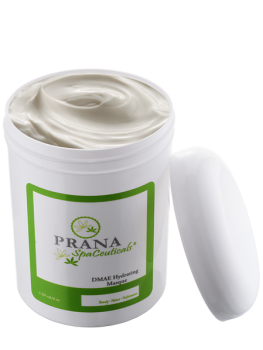 Prana DMAE Hydrating Masque, 8 oz is overloaded with powerful ingredients to help calm inflamed skin. DMAE Hydrating Masque is specially formulated for sensitive skin, Rosacea, and eyelids and post microdermabrasion and peels. Ingredients: Certified Organic Aloe Vera, Sodium Hyaluronate, Squalane, Vitamin E, DMAE, Alpha Lipoic Acid, Vitamin B5, Chamomile Extract, Azulene, Cucumber Extract, Vitamin C (1-Ascorbic Acid), Allantoin, Orange Extract.